I can’t believe it is already October. Bring on the goblins and ghosts.. It’s the season for monsters! 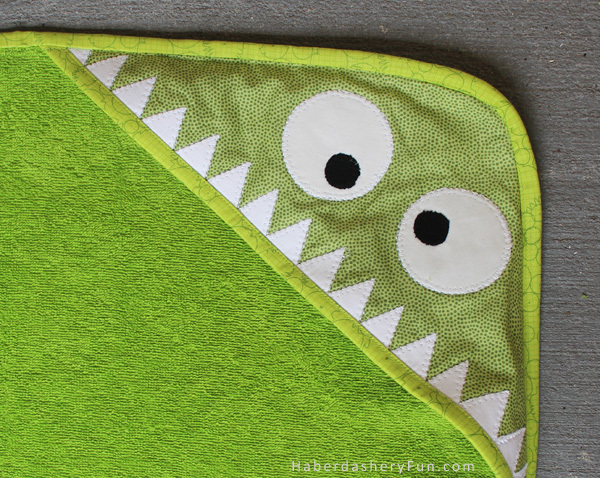 Last March I posted a tutorial on how to sew a baby and toddler hooded towel. It has been quite a popular post, both here on my blog and also on Pinterest. With Halloween just around the corner, I thought it was the perfect time to create a fun monster update. Click here If you would like to check out the original post. Pin the hood piece onto the terry towel at a corner. It will be larger than the towel, so just match the edges together. It is ok that there is a excess fabric in the middle [a bump]. This is where the baby’s head goes.. Baste in place. Now repeat steps above for sewing your binding in place. This will sew the binding around the outside edge of the towel.. That’s it. Your towel is complete! Thanks for stopping by. It has been quiet on my blog the last week or so.. We’ve been on vacation. 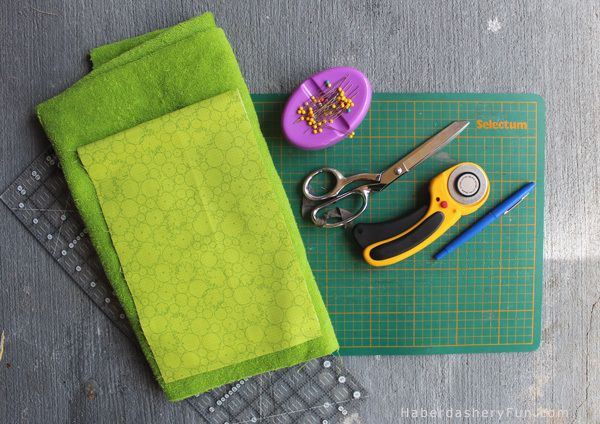 I couldn’t bring along my sewing machine, so I decided and I take a slight breather and lay low for a few days. Please let me know if you have any questions on this project. You can leave a comment or email me through my comment page. If you email me, please make sure to write the question in the “big box” so I can answer you back. I love hearing from everyone. Want more monsters? Check out my monster facecloths here. Love the wonky eyes! So cute. Every kid needs one of these! I love this! Every baby needs one 🙂 ITA with Karin– the wonky eyes make it perfect. I love how cute this guy is – quick question, though – how do you keep the terrycloth from tearing up? My last attempt the terrycloth felt like it was disintegrating from the edges inward and kept gunking up my machine. Any tips? I’d also like if you’d link up to my new link party – http://www.dreamalittlebigger.com/post/link-party-9.html Hope to see you there! That might be the trick! Give it a shot and I’d love to hear how it goes. PS. Love your blog, just went over and cruised around some more. You have some great tutorials. This is adorable! I wish my son would wear the hoods on his towels because he’d look so cute in something like this! 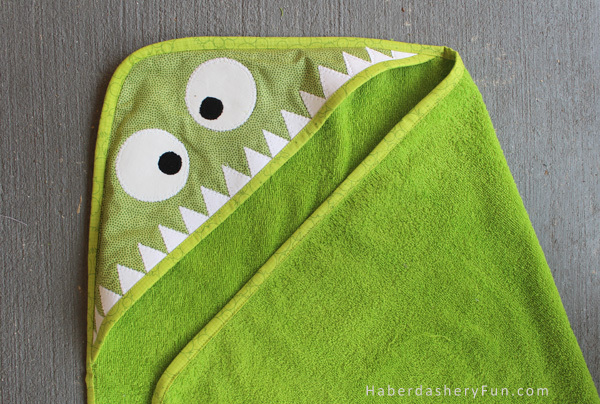 What a fun idea for a hooded Towel. Thank you for sharing. Oh My Marni! Can I just gush and say I just love all your projects:) You are such an inspiration. I will be featuring your monster towels tomorrow! I so must try this!! Thanks! Agh.. Thanks Tori! I love what your creations as well! Congrats on being a part of the Silhouette design team! Hi Kelly, Thank you. Your comment means alot cause I love what you are up to over at your blog! !